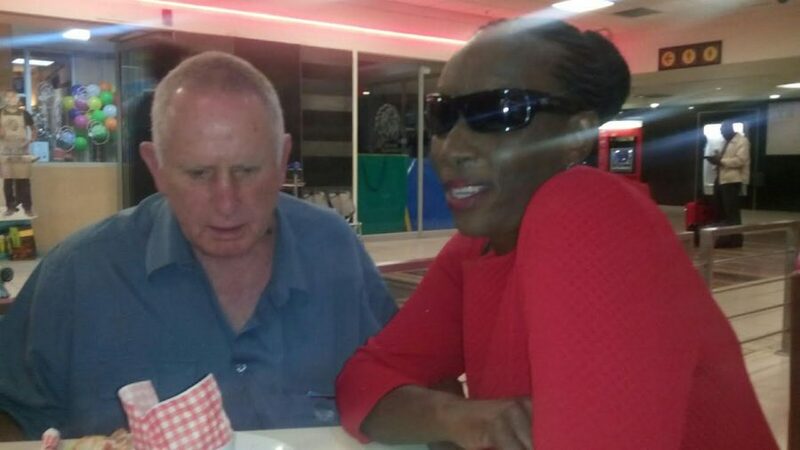 A chance late night call from a blind Vosloorus woman to Talk Radio 702 resonated with a man in Wales, who decided to make her life a little better. With the connivance of a 702-call screener, contact was made. Emails went back and forth for the next six months until he and she met at OR Tambo International, earlier this year. No, this is not a love story; it is a feel good tale of a man who, for sentimental reasons, listens to South African radio stations. John Miller is the man in Wales. Dubbed “John from the UK” by 702, he’s a conservation writer, who also specialises in travel for the blind. Unbeknown to the anchors of the radio stations he calls, John is himself blind. Here is his story. As a blind person, radio is my preferred medium for news and chat. I spent my formative years in Zimbabwe and most of my working life in Johannesburg, South Africa, which probably explains why Radio 702 is on my radar. Late night listeners would know me as an active caller-in. Those words touched me and I slowly built up a picture of Nosisa through her regular calls to the radio station. I discovered she was unable to use social media as she would have liked, because her 8-year-old phone was unable to cope with the latest applications. Unbeknown to me at the time, Nosisa’s husband Kubuse is also blind, but it was he who he acted as the go-between for the next several months; we exchanged emails and I sent hints and tips about how a blind person could use an iPhone. The months passed and a long-planned trip to visit my brother in Durban finally arrived. Ahead of my return journey, I phoned Nosisa from Durban – it was the first time we actually spoke to each other. We arranged to meet at Wimpy while I was in transit at OR Tambo International in Johannesburg. As Murphy would have it, my Kulula flight was late. Airlines throughout the world have a policy where disabled people or those who require passenger assistance are first on and last off. On this occasion, I told the cabin crew I was not going to wait to be last out and if need be, I would make my way on my own out of the aircraft. This urgency was necessary as Nosisa had called me twice while waiting for the doors of the aircraft to open, probably still wondering if I was going to meet her, and probably more importantly if I had the promised iPhone. The crew obliged me and soon I was greeted by two of the ground staff. I impressed upon them my need to go ASAP to a meeting with a blind lady. Nonetheless, Murphy stalled me again and my luggage seemed to be the last off the carousel. At last I made it to my destination, where a much-relieved Nosisa awaited me. There were hugs all round and then, against the background of a clatter of plates, knives and forks and chatter and laughter from nearby tables in the restaurant, it was time to begin my lesson on how to use an iPhone. Amid the mixed emotions we all felt, I gave Nosisa an idiot’s guide (I’m no expert) to how iPhone can help blind people gain their independence. I hope by now she has joined those of us reading and sending messages via text and email, using WhatsApp and Skype and communicating with the outside world like the rest of the planet. I cannot begin to tell you the sense of freedom this gives a blind person. Blind people are no longer blocked from the world of social media, nor do they have to rely on someone sighted to read or write for them. I have immense gratitude for the myriad dedicated apps for blind iPhone users, which can in real time tell the user what colour his or her clothes are or what colour objects are around them. There are apps to read bar codes and labels, to let us know whether lights are switched on or off and to assist with foreign currencies. There is even an app to reveal whether someone is smiling at you! In short, the world is now Nosisa’s oyster or put another way, Nosisa is now part of the real world. Perhaps next time you upgrade your iPhone (providing it is a 4S and upwards), you too can bring light and joy to a blind person’s life. * Without the help of 702 personnel, this meeting would not have taken place. Thanks to presenters Gushwell, Florence and call screener Mmakgomo, who made the meeting possible. Apple founder Steve Jobs and his designer successor, Sir Jonathan Ive, were the first to make smart phones user-friendly for blind people, thanks to a built-in voice or screen reader called VoiceOver. VoiceOver is among Apple’s Accessibility features where the iPhone (4S and upwards) speaks what is written on the screen. With a series of double taps on each of the icons or applications and by using one, two or three finger swipes, the phone loudly vocalises exact locations on the screen, thus enabling the blind person’s ability to navigate the way through the various pages of applications. To activate VoiceOver, go to settings, then general, then Accessibility and turn VoiceOver ON. Siri, Apple’s voice-controlled personal assistant, also enables a blind person to send and receive SMSes. Reading the story about myself and John, I can’t help but be emotional all over again. Indeed the gift from John changed my life for the better. I without a doubt regard John as my angel on earth.